Sul, Sul, it's time for a celebrity celebration! 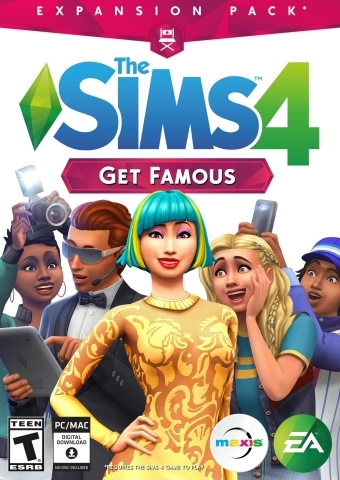 Electronic Arts Inc (NASDAQ:EA) and Maxis™ today announced the worldwide launch of The Sims™ 4 Get Famous* Expansion Pack available on PC and MAC. With The Sims 4 Get Famous, players can have their Sims live out their wildest dreams of fame as they become A-list celebrities and experience a life of stardom in a brand new acting career, or gain worldwide acclaim in their current career as a chef or musician. It doesn't end there though! Players can also dress up their Sims in designer fashion and attend VIP parties, living their best Sim lives in glamorous mansions with lavish decorations, like a golden toilet or sleeping pod, in the dazzling new world of Del Sol Valley. Become a big star through an all-new acting career where players' Sims can catch their big break with a role in a television series or a commercial gig or land a starring role in a blockbuster film fighting pirates. Looking for fame some other way? With the addition of new skills, Sims can pursue stardom as an influencer streaming at a new video station or gain international fame in any career they choose. As players help their Sims rise from a nobody to A-list celebrity status, they can earn Fame Points and unlock new perks and quirks and craft their public image with the brand-new Reputation System. Whatever their claim to fame, Sims will receive the VIP treatment, rub elbows with fellow world-famous stars or get photographed by the paparazzi, all while gaining the adoration of die-hard fans from too near or far. Players can even meet the Simmified version of real-life social media and pop star Baby Ariel in The Sims 4 Get Famous, who can be spotted performing a song in Simlish in public spaces or strutting down Starlight Boulevard. "The Sims 4 Get Famous gives players a chance to experience the highs and lows and everything in between when it comes to the wild, unpredictable life of fame," said Grant Rodiek, Senior Producer. "With the new acting career, Sims can pursue their breakout role in the show business, or step into the spotlight in any career of their choice - the possibilities are endless! Our team has worked hard to bring this highly-requested expansion to the players, and we can't wait for them to tell exciting new stories of their Sims' path to stardom in Del Sol Valley." In the brand new world of Del Sol Valley is a city full of dreams for Sims on the road to fame and fortune. From starting up in a modest home in Mirage Park to working their way up to a lavish mansion in the hills of The Pinnacles, this place is where dreams become reality. Players can decorate their Sims newly acquired homes with new modern furniture, fill their mansion with gold-plated furniture that is never too extra, or add a money vault just to hold their riches. In addition, players can gain fame with their Sims by establishing themselves as fashion icons, becoming a trendsetter with chic new streetwear or designer outfits. The most famous Sims can even be immortalized by having a legendary diamond on Starlight Boulevard. Being rich and famous can be unpredictable, but whether players make it rain with their Sims or burn through their Simoleons, they'll never look back once they have a taste of the VIP lifestyle. Download The Sims 4 Get Famous Expansion Pack now on PC and Mac on Origin™. The expansion pack is rated "T" by the ESRB. For more information and to stay on top of the latest The Sims 4 news, please visit www.TheSims.com. Maxis, The Sims, EA SPORTS, Battlefield, Need for Speed, Dragon Age, and Plants vs. Zombies are trademarks of Electronic Arts Inc. John Madden, NFL and FIFA are the property of their respective owners and used with permission.